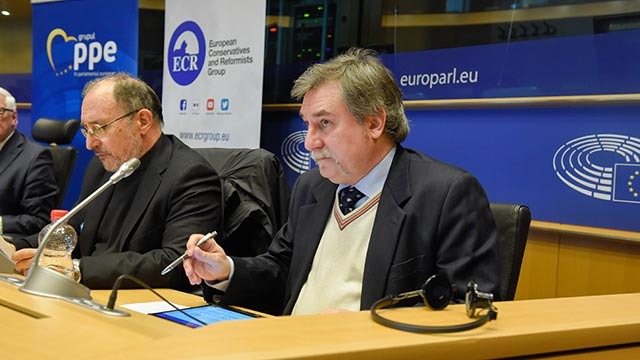 Mr. Marco Respinti, Director-in-Charge of Bitter Winter delivered a slightly shortened version of the following text during the seminar Freedom of Religion in China, organized at the European Parliament in Brussels by Mr. Bastiaan Belder, Dutch representative for the European Conservative and Reformists Group (ECR), Mr. Cristian Dan Preda, Romanian representative for the European People’s Party (EPP), and Mr. Josef Weidenholzer, Austrian representative for the Progressive Alliance of Socialists and Democrats(S&D). Distinguished hosts, MEPs, Mr. Ambassador, speakers, ladies and gentlemen, it is an honor and a pleasure to be here today for such an important topic. Bitter Winter was launched in May 2018 as an online chronicle on religious liberty and human rights in China. It is published daily in eight languages (English, Chinese, Italian, French, German, Spanish, Korean and Japanese) by CESNUR, the Center for Studies on New Religions, headquartered in Torino, Italy. In fact, its Editor-in-Chief, is Massimo Introvigne, one of the most famous expert on religion, founder and managing director of CESNUR. Your truly serves as Director-in-Charge since the founding. Bitter Winter was born out of a quite original combination of scholars, journalists and activists of human rights from different countries who work together to give voice to the voiceless by publishing news, documents, and testimonies about persecutions against all religions in China. The unique feature of Bitter Winter is its network of several hundred correspondents in all Chinese provinces. At high risk for their security, they continuously report on what happens in China and how religions are treated or mistreated. They often supply also exclusive photographs and videos. In this way, we have been able to prove and document repression, crack down and violence, from torture to death, as well as fake news spread for propaganda by the Chinese Communist Party on religious groups and individuals. One of our scoops was releasing a video from inside one of the impenetrable and ill-famed “transformation through education” camps in Xinjiang, where at least 1.5 million people are detained, two thirds of which being Uyghurs imprisoned just because they are believers (Muslim) and an ethnic minority. Apparently our reporters do an excellent job in exposing the horrible truth of religious persecution in China and Bitter Winter is a serious media outlet. Who says that? The Chinese Communist Party itself that uncompromisingly rules China with an iron scepter smashing all opposition and treading on human rights. Between August and December, 2018 the Chinese Communist regime has in fact arrested 45 of our reporters for filming incidents of, or gathering news about, the CCP’s persecution of religious freedom and violation of human rights. They have been usually detained and interrogated on the charge of “divulging state secrets” or “involvement in infiltration by foreign forces.” Some reporters have been sent to “legal education centers” to undergo mandatory indoctrination, while others have been tortured and abused. The reporter who courageously filmed a “transformation through education” camp in Xinjang was among the arrested. Some of them have been luckily released since, but they are always under strict surveillance and this paralyzes their work for Bitter Winter. Others are instead still detained, and we know nothing of their fate. Working day by day for Bitter Winter three main issues appear all the more chilling. First, Sinicization. It’s an old word and an old concept dating at least from the 17th century to indicate the assimilation of minorities into Chinese culture and language. The CCP, however, gives to the word “sinicization” a different meaning. It is not enough that organizations operating in China, including religions and churches, have Chinese leaders. In order to be accepted as “sinicized,” they should have leaders selected by the CCP and operate within a framework of strategies and objectives indicated by the CCP. Under the guise of harmonizing religion with Chinese customs, in fact “sinicization” tries to distort all faiths conforming them to Communist ideology. Second, xie jiao. Often incorrectly translated as “evil cults,” the expression xie jiao (which has been used since the late Ming era) means “heterodox teachings” and indicates the religious movements included in the list of the xie jiao, which the government regards as hostile to the CCP, dangerous, and not “really” religious. Xie jiao are prohibited and harshly persecuted. Being a member of a group designed as xie jiao spoils the believer of every human right, de-humanizing him or her. This is why they can be harassed and tortured with all possible cruelty. They are no more human beings. But the point is that there is no clear and accepted definition of the xie jiao and so, basically, a xie jiao is any group listed as xie jiao by the government which, paradoxically, being atheistic claims to decide what religion is or is not. Third, and last for today, the war on the very idea of God. Communist China has always judged religion as unnatural and thus sooner or later doomed to extinction. While awaiting this fate, the CCP has contributed to reaching the extinction of religion with varying degrees of harshness depending on times, leaders, national and international contexts. The “New Era” of Xi Jinping favors a rapid acceleration with a direct assault on faiths, both those banned or somewhat tolerated and those approved and controlled by the state. This means one thing only: the CCP considers God its very enemy. Why? Because God is a direct rival of the CCP. Believers are increasingly compelled to remove and destroy religious images to substitute them with portraits of Mao Zedong ad Xi Jinping. They are jealous gods. The Communist regime in Albania, one of the worse of all history, declared itself the first atheistic state of the world in 1967 and waged explicitly war on the very idea of God in its 1976 Constitution. The CCP is doing it again today, in spite of the fact the Chinese Constitution grants, nominally, religious freedom. God must become extinct. In the meantime, the Chinese government is making believers become extinct. For all these reasons, the world has to call China to fully face its responsibilities in front of history and posterity, and I think that some sort of “ethical tariff” should be imposed on Beijing. 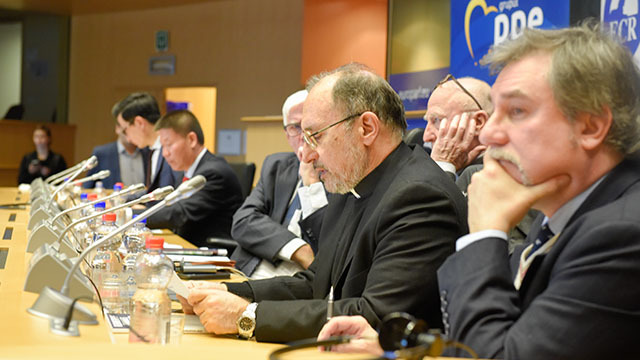 Here at the European parliament in Brussels, I then call The High Representative of the European Union for Foreign Affairs and Security Policy and Vice President of the European Commission, Federica Mogherini, and the members of the European Parliament to make full use of their meetings with the Chinese authorities as well as the UN human rights mechanisms to convey their concerns to the Chinese government and urge it to comply with international standards regarding freedom of religion or belief.